The Honduran Congress has been asked to approve a deal which might lead to the return to power of ousted President Manual Zelaya. 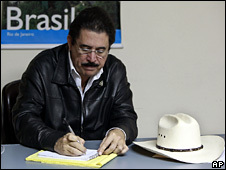 The accord has been signed by teams representing Mr Zelaya and the interim government which came to power in June. The deal would create a power-sharing government and require the bitter political rivals to recognise the result of November's presidential poll. Meanwhile, the US is lifting visa curbs on Honduras after Friday's agreement. 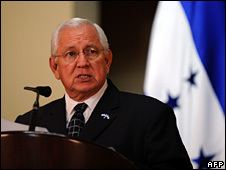 The sanction was imposed amid international condemnation of Mr Zelaya's removal. But officials said the US embassy would start issuing visas again on Monday. The president was forced out of the country on 28 June. His critics said he was seeking to amend the constitution to remove the current one-term limit on serving as president, and pave the way for his re-election. The BBC's Central America correspondent Stephen Gibbs says the Honduran congress - which in June voted to remove Mr Zelaya from power - now looks set to be instrumental in bringing him back. It will vote after the Supreme Court gives a non-binding opinion on the deal, news agencies report. No clear timetable has been laid out for when the vote will actually happen, but the ousted president has indicated that he expects the entire process to take about a week. Mr Zelaya is making it clear that until every detail of his reinstatement has been pinned down, he will not be leaving the capital's Brazilian embassy, where he is currently sheltering, our correspondent says. Many Hondurans are, however, already expressing relief that the crisis which has overshadowed their country for the last four months might almost be over. Our correspondent says the key detail of the arrangement is that Mr Zelaya comes back to power, so that Honduras' scheduled November elections - to decide who will replace him - are therefore deemed valid. But it is not perhaps the comeback which President Zelaya once promised, our correspondent adds. From exile he had suggested that a popular uprising would restore him to office. In the end, it seems that more mundane economic realities, and some straight talking by American diplomats, persuaded the government which forced him out, to relent, our correspondent says. Crisis over Zelaya ends but can splits be overcome?